The last two weeks have been all about fort building at our house. The girls start with the dining room table and expand the space with boxes and chairs draped with old blankets and tablecloths. 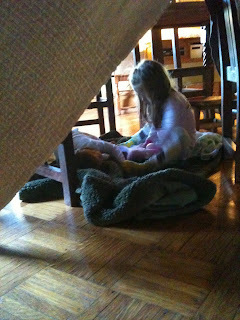 Building a fort is a quintessential childhood list activity that I have been anxiously awaiting. I loved to build forts with my sisters when I was a kid. There is something about having a hideaway right in the middle of everything that makes a fort so appealing. Both the Bee and Bean enjoy spending time in the fort and although I am occasionally invited in it is mostly a place that they play together. The look at books or play pretend games but it seems to be an activity that holds both of their attentions for a long time, partially I think because there are so many possibilities in a fort. This is certainly a well-liked childhood activity. There is so much to love about forts. Not only can they be a great inspiration for a child’s imagination, it also teaches children how to work together.